EMS Today 2019 Conference at the Gaylord National Resort! Traumasoft announces the first mobile EMS Scheduling App built specifically for EMS professionals! EMS Today offers networking with 4,600+ EMS professionals from around the world, countless hands-on experiences (both on-site and off-site), 240+ CEH opportunities and the most innovative products and services available to the industry displayed by over 250 exhibiting companies. EMS Today is produced by JEMS, the leader in EMS education for over 35 years. EMS Today is a unique – and stimulating – experience for EMS personnel worldwide, and it is supported and fed by the credibility, quality and excellence of JEMS. 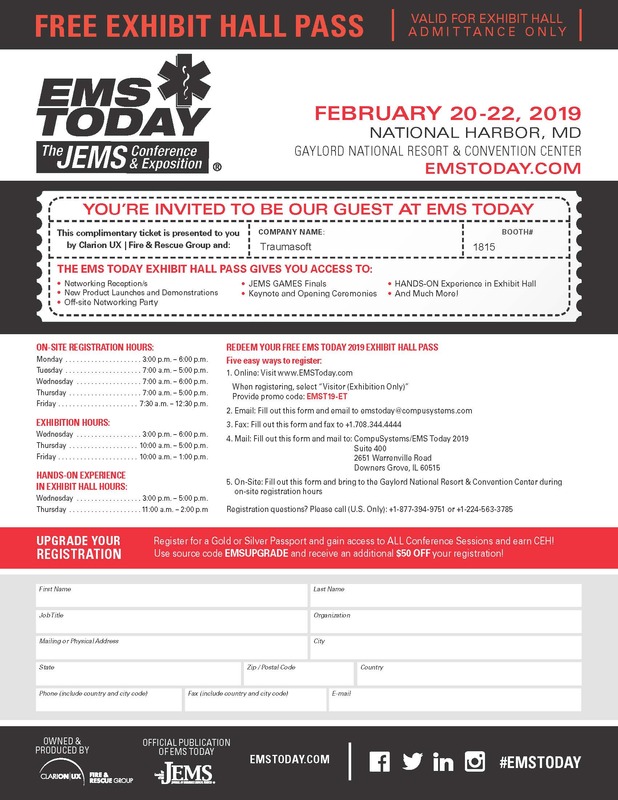 You’re invited to be our guest at EMS Today 2019! Your Free Exhibit Hall Pass gives you access to: Networking Reception/s, New Product Launches and Demonstrations, Off-site Networking Party, JEMS GAMES Finals, Keynote and Opening Ceremonies, Hands-on Experience in Exhibit Hall and much, much more! Don't delay, request your free demo today! Request a demo form submission from website. Experience a World of Difference in EMS management software. Traumasoft is an all-in-one system capable of managing every aspect of your EMS operation. One system comprised of interconnected solutions handles staff, integrates processes, manages equipment, and grows revenue. Gone are the days of multiple software providers and disconnected solutions.